If you've read our "Best Of" lists, you'll know we're serious when it comes to audio. And while we all love the over-ear approach to gaming, we know there's a time and a place where you need to take the cans off and shake your space with ground-breaking sound. Whether you need a pair of low-profile desk speakers for everyday use, or a massive 5.1 surround sound setup for some serious dungeon crawling, you've come to the right place. No matter what your speaker needs may be, below you'll find the perfect sound system to level up your gaming setup. For more background information on computer speakers, see our comparison table and buying advice below the picks. 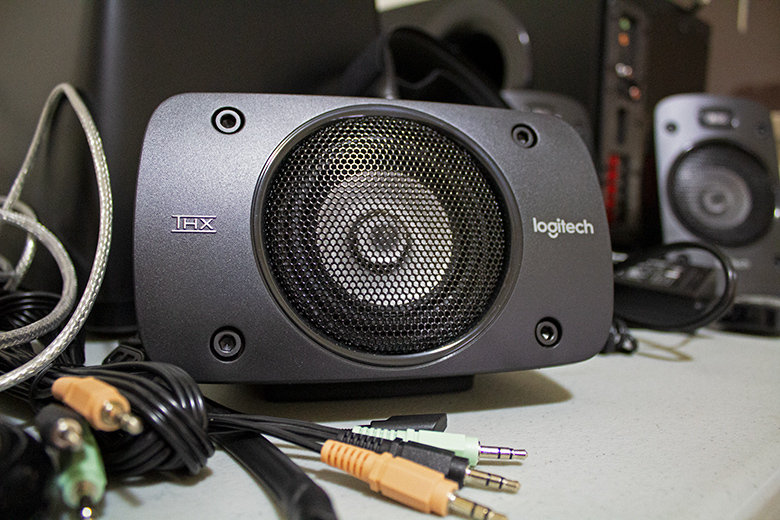 What We Like: Amazing audio and build quality, perfect size for desks. What We Don't: No Bluetooth. No question about our number one here. Hedging the line between computer and bookshelf speakers, the A2+ from Audioengine deliver on all fronts receiving our A+ grade! These speakers, while innocuous in design, will provide a full and crisp sound to your favorite Spotify playlist, newest Netflix craze, or current game of choice. We felt that the A2+ hit that sweet spot for computer speakers, striking the perfect balance between size, price, and audio quality. They are small enough to sit comfortably on even the most modest desks, but still able to fill medium sized rooms with surprisingly large sound. To top it off, they're quite stylish. The A2+s look as good as they sound and are available in a variety of color options that make them stand out in any setup. With an assortment of input and output options including 3.5mm, RCA, and USB, the connectivity of these speakers is impressive, and although a Bluetooth option like that on the Edifier R1700 would have been nice for the price point, it isn't essential. Even lacking Bluetooth, there's no contest for our top pick here – with the highest blend of value, build, design and audio quality, the Audioengine's A2+s are our unquestioned leaders. What We Like: Design, sound quality. What We Don't: Hardwired cabling could cause repair issues. Undoubtedly the most unique-looking set of computer speakers on our list, the SoundSticks III designed by the legendary Harman Kardon make a notable first impression. Their transparent casing is complemented by black rubberized bases and a white light that radiates from the sub when in use, as well as a blue light that springs to action when Bluetooth is connected. The silver braided cables extend the look, and without fail, everyone who saw these kicking around the office asked us what they were and how they worked. But looks aren't everything, and when asked how they sounded, we could only answer with, "superb". Mids and highs are handled brilliantly by the two satellite speakers, while the lows bumped with the adjustable subwoofer. The amount of raw bass the SoundSticks can pump is incredible, and we were floored by how much quality sound could be squeezed from such unarming speakers. We much preferred the SoundSticks richness and depth of sound over the Logitech's G560 and any other 2.1 system that dared to compete. We were worried at first by the fact that the cables were hardwired to the unit — a pitfall we'd rather been navigated by design on a product of this price – but we were very satisfied by our pull tests and have to say these cables are strong and durable, able to last through any and all reasonable use. This 2.1 setup provides near flawless performance across movies, games, and music. With a wicked design, incredible sound, and versatile connectivity, these are definitely some of the best computer speakers we've ever tested, and easily our favorite in the 2.1 category. What We Like: Powerful, versatile. What We Don't: Cable management could be better. 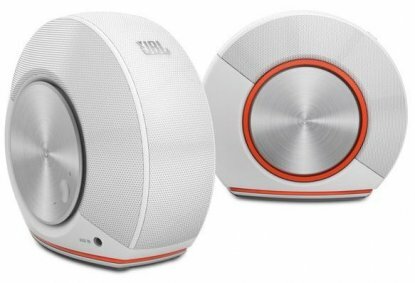 With their excellent build quality, practical functionality, and immersive audio, the Z906's from Logitech are undoubtedly the best 5.1 desktop speaker solution available at this price point. The speakers sound fantastic; the lows are handled by a subwoofer that isn't too aggressive with its output, and the mids and highs are delivered through the satellite speakers with a crispness that makes in-game positioning natural and easy. You can adjust the sub, rear, center, and front speakers' volumes independently to achieve the exact sound you want. We played with the different volumes and noticed no frequency muddling, and we have to say these puppies get nice and loud without becoming oppressive. One thing that really impressed us during our testing, was how easy it was - just the click of a button - to alternate between a 2.1, 4.1, and 5.1 setup. Don't get us wrong, the 2.1 mode can't compete with Audioengine's A2+ for fidelity and accuracy, but it's nice to have options. The center console allows for input selection, stereo mode, and individual volume control of each of the five satellite speakers. Build quality is top notch, with the speakers and sub carrying a weightiness to them, while the finish – although made from durable plastic – looks high-quality. The only warning: we have to note that the Z906's setup can be tricky. To get the most out of this system, you need to have the rear speakers at optimal height and distance from your chair, and to do that, we recommend you pick up speaker stands to get the setup just right. For those not up to the task of setting up a true 5.1 system, we recommend you take the easy route with the Razer Leviathan; however, if you've got the time and space, the performance you'll get from the Z906 is definitely worth your effort. What We Like: Bluetooth, surround sound. What We Don't: Sub-par subwoofer connection. 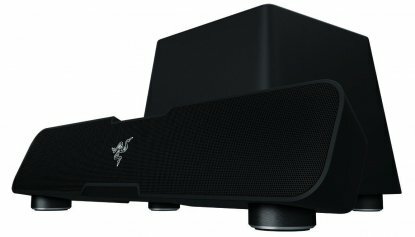 Using multiple drivers and Dolby's Pro Logic II wizardry, Razer have delivered a hell of a solution for those looking for a compact speaker system that goes beyond the standard 2.0 or 2.1 options out there. We were surprised by how much this bad boy even outshone the Logitech G560 and Bose Companion 2 speakers. 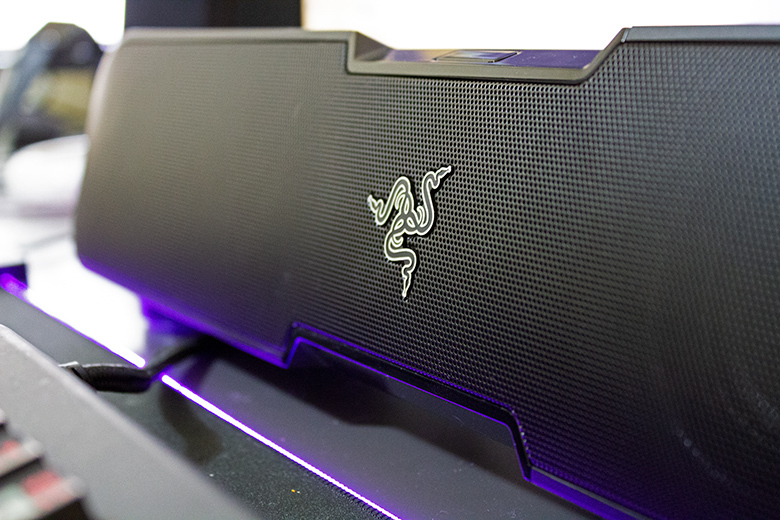 And, while we know there can be no perfect imitation of a premium 5.1 setup, the Razer Leviathan comes close. With 5.1 virtual surround sound packed into an elegant - not a word we often use for Razer products - soundbar that sounds as sleek as it looks, Razer has really impressed us. The sound positioning was on-point during our testing with multiple shooter games. The highs and mids carried a ton of in-game details, and the bass added a nice touch to the immersiveness of our experience without muddying the sound. The simple and intuitive buttons made it easy to switch EQs when we wanted to test movies, and music, and we felt the soundbar preformed solidly with both. Bluetooth, Optical, and a 3.5mm connection made this speaker incredibly flexible and we fell in love with the NFC that let us instantly pair our Android phone. The design is great overall - we love the clutterless idea of a soundbar that is designed to sit underneath your monitor, and a sub that hides beneath your desk. Our only gripe is that the sub-to-speaker connection felt a bit loose, our model even had issues with a fiddly connection later in testing. 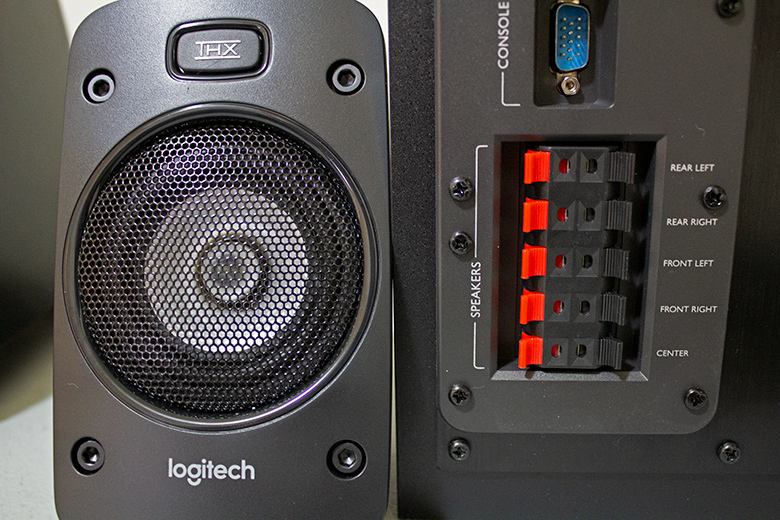 When the sub was connected properly, it shook the office - so those looking for less bass and more peace should check out the true 5.1 setup found in the Logitech Z906. For those looking for a compact, easy-to-use, powerful, and feature-rich audio solution, we recommend checking out the Razer Leviathan. 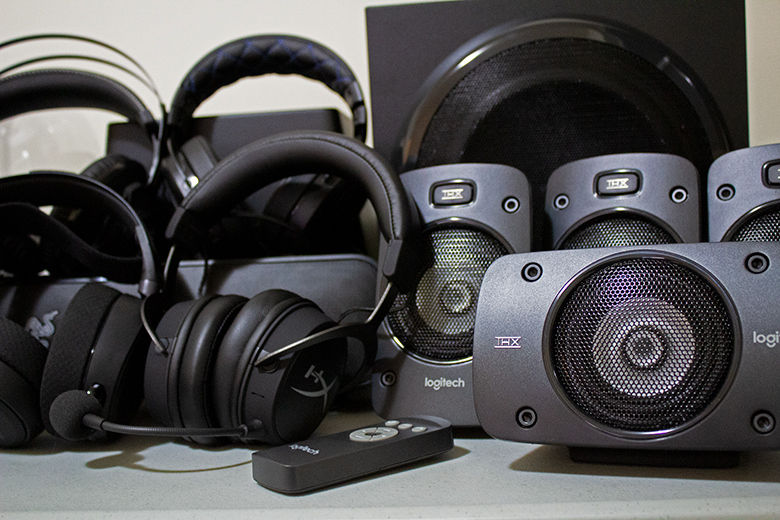 What We Like: Amazing value, decent sound. What We Don't: Low build quality - as you'd expect for this price! If you're looking for an upgrade that will trounce your built-in speakers on a budget, then the Creative A250s are perfect for you. Although not the best sounding speakers overall, they are the best you'll get for $30. Period. These speakers do a lot for less, and with crisp sound that can fill a surprising amount of space, it's hard not to recommend them. In fact, during testing, the A250s even beat out the the Bose Companion II speakers in sheer volume and richness of detail. While this setup sounds like it's worth more than you paid for, it won't necessarily feel like it. Without a doubt, you're sacrificing build quality and features for an affordable price. The product feels light and fragile, and we were worried about damaging the unprotected driver. The sub sounded surprisingly good and the default audio balance was decent - which is a relief because there are no knobs to adjust it. The A250s are more than adequate for gaming, but movie and music lovers may be put off by their slightly muddy mids. If you're willing to spend more, the Edifier Exclaims e10s offer a much crisper sound. Regardless, the A250s provide amazing value. They might not be flawless, but they look and sound better than anything else you'll find at this price, guaranteed. What We Like: Amazing value, visually- and audibly-pleasing design. What We Don't: Lack individual bass, mid, and treble controls. 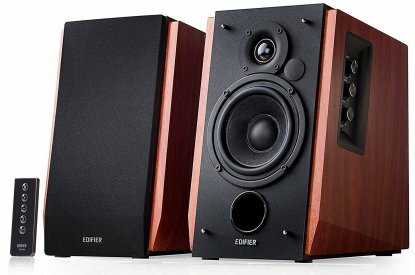 To be as straight up as their design, at this price point, the Edifier e10s are pretty much untouchable. 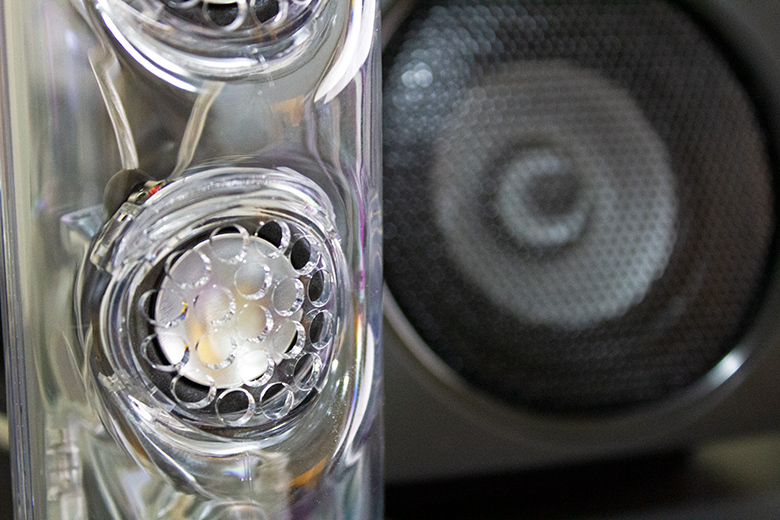 Delivering crystal clear mids and highs, the e10s from Edifier do everything but disappoint. The lows, although not as prominent as the Leviathan or SoundSticks, still kick hard for a 2.0 system and would wow buyers looking for a subtler bass solution. Although the Creative T40s came close, there's nothing around this price that really competes with the e10s in the 2.0 category. These speakers even manage to look stylish and contemporary while delivering premium sound. Our only reproach stems from the e10s' lack of individual bass, mid, and treble controls. Sure, there are plenty of software solutions, but we'd have loved a dial or three. We also have to note that these speakers are not for the EDM inclined buyers, and can begin to struggle when faced with really bass-heavy tracks played at high volumes. But if you're more inclined to host a late-night raid than a rave, and want speakers that will deliver incredible quality for a great value, we will always recommend these! What We Like: Amazing RGB integration, loud and rich sound. 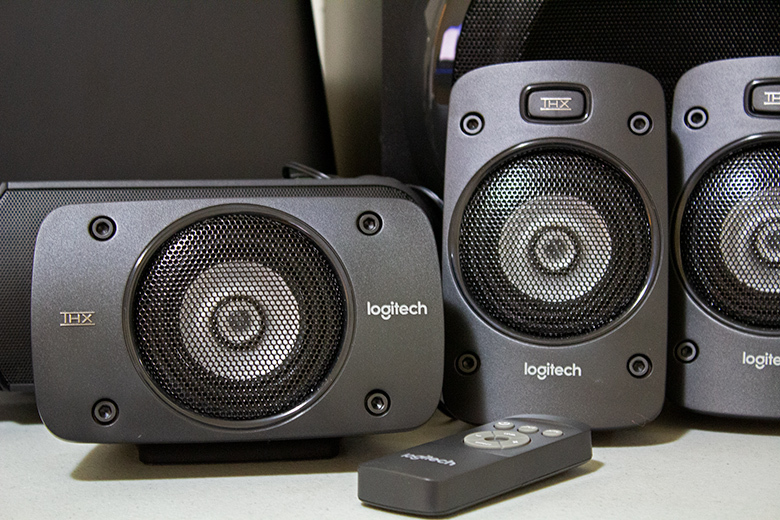 If you're looking for speakers that dazzle, Logitech has a 2.1 option for you. Their G560 setup is outstanding.. We have to begin our praise with Logitech's LIGHTSYNC technology; while some may see it as an absolute gimmick, the ability to sync your speaker's RGB light settings with in-game sounds, music, and movie soundtracks is actually pretty cool. Traditionally, our stance on RGB lighting is that it detracts from player experience, but when it's done right, we're proven wrong. During testing, we even found that positional lights could be helpful for identifying in-game elements. However, we'd only put up with RGB madness if the sound was good. And that's exactly what it is. We were very happy with the G560s' loud and bassy profile. While they weren't as good as the Harman Kardon SoundSticks III or the Audioengine A2+, the G560s deliver a detailed and immersive experience that handles games, movies, and music with richness and poise. The design and build quality is impressive overall - the satellites and subs look good and feel durable. The volume controls and easy connection features are also a sweet addition, and everything seems built to last. Apart from paying for gimmicky lighting, our only real complaint is common amongst budget 2.1 setups, and that is a plethora of delicate and unsightly connections hardwired into the sub and satellites. These can be annoying for people who crave a cleaner setup, and with this model being so visually focused, we wished there had been a more elegant solution for the cables. But, all things considered, this is a hell of a sound system for the price, and an easy recommend for someone who wants a more immersive, sub-powered sound, with some cool RGB features. What We Like: Great build, sound, and immersion. 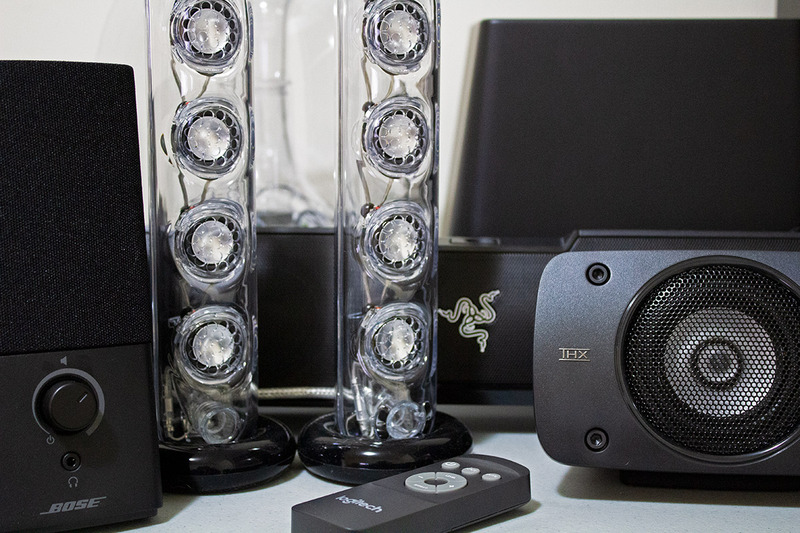 Razer slides another set of speakers into our top ten with their gamer-centric Nommo Pros. Advertised as 'big clean audio', we have to agree that's what this 2.1 brings to the table (or desk). The sub is an absolute monster, and like Razer's Leviathan, will make you feel the lows. The satellites look more like anti-air guns than speakers, but they still manage to sound great. They're balanced with rich layered sound that comes across clear. And with some equalizing - made easy via the Razer software - you can really sculpt the sound to suit your preferences. While some might refer to these as the 'Beats of speakers', we'd have to disagree. 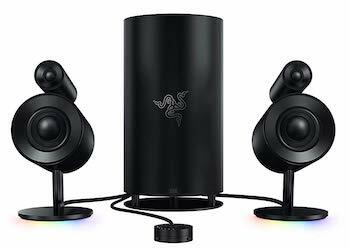 Audiophiles will likely never embrace Razer as real contender, but these speakers are the real deal. Overall, we were quite happy with the Nommo Pros. They were more flexible and sounded better than even the G560s. The entire 2.1 system was designed well, built to last, and comes with the full gamut of connectivity options, making it a supremely universal pick. The Nommo Pros' only drawback is that you'll be overdrawn after purchasing them. These speakers are expensive, and while we believe you're getting a great product with value, we still don't think these are quite worth the full $499. If they cost less, they'd be higher on our list. That said, if you can afford them, the Nommo Pros are a great choice that you're sure to love. What We Like: Great value, fantastic build. What We Don't: Bluetooth wasn't perfect. At first glance, you can see that an insane amount of attention to detail has been put into the design of the Edifier E21 Luna Eclipse HD. 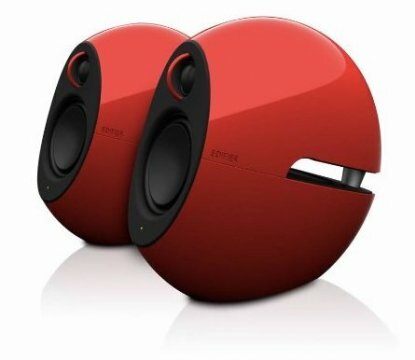 They can even make the flashy KEF EGG look straight up boring. And we're happy to report the Lunas sound great too. This 2.0 Bluetooth sound system really pops, producing clean and crisp highs and mids, while managing to deliver decent lows without a sub. The soundstage is surprisingly refined for the price, and while it doesn't hold up to the depth of the SoundSticks, the Lunas will definitely provide a solid and balanced sound to anyone's setup. Like the Razer Leviathan, the KEFs include a 3.5mm, optical, and Bluetooth connection, and we always appreciate that level of flexibility. Unlike the Leviathan, the Lunas don't come equipped with NFC Bluetooth connection to instantly switch between devices. In fact, we didn't love the way these speakers handled Bluetooth overall. We found they were a bit awkward to pair, and annoying when trying to switch between devices. However, that is a very minor gripe and don't want it to detract from the fact that these are a wicked looking, well built, and awesome sounding pair of Bluetooth 2.0 speakers that, for the price, have solid value. What We Like: Best sound quality. What We Don't: Big and pricey. Without a doubt, the A5+ are the best sounding set of speakers on this list and are a direct upgrade to the already awesome Audioengine's A2+ in every aspect except one: Price. Everything sounds good on these monsters; whether it's movies, music, games, these speakers deliver the goods in the lows, mids and highs. All we heard was crisp and fluid magic, with zero muddiness throughout the frequencies. The bass is handled incredibly well with this model, but we should mention that these are for fans of unaltered sound. Those who are more interested in that sub-powered bass you can truly feel might prefer Harman Kardon's 2.1 option, the SoundSticks III. Cash isn't the only thing you're going to need a lot of if you take these babies home. Their size means you are going to need desk space for a proper setup. These are bookshelf speakers and dwarf models like the Bose Companions. That said, the A5+ speakers are still incredibly elegant and will look great in any setup that incorporates them properly. If the price hasn't already turned you off, you should turn these on, because we know the A5+'s will turn your ears on once you hear them. What We Like: Warm smooth sound, Bluetooth functionality. What We Don't: Bass sticks out. Edifier are back on our list with their R1700BT speakers. The BT stands for Bluetooth, which means these speakers are wirelessly delivering a sound that is easy on the ears. With mids and highs sounding earthy, tight, and detailed, our only real gripe is with the prevalence of the bass. The bass was incredibly strong for 2.0 speakers, but regardless of tweaking, it didn't seem to completely gel with the mids and highs. But if you are someone who wants more bass than the e10s can offer, the R1700BTs sound great at any volume. For those who favor more modern designs, you won't be overly keen on a wood finish for a computer set-up. So, with their faux-wood casing, the R1700BTs won't hold up to some aesthetic critiques, but we have to admit they do look really nice. With the right setup, these speakers can really make a statement in a room. Their solid design is accompanied by a quality build, and these have a robust weight and feel that we appreciated. If you can work the wood look into your room and are looking for a bit more bass out of a 2.0 setup, the R1700BTs could be the ones for you. What We Like: Iconic design, balanced sound, flexible connectivity. Although we've had some contentious opinions about the KEF EGG in the past, it belongs on our list. If you can afford it, it's a one stop solution for all your audio requirements. The EGG's sound has a level of detail and warmth that Audioengine's A2+ and A5+ fall under, due to their preference towards a flatter response. Thanks to a clever design that sits the tweeter in the middle of the driver, these speakers have an extended sweet spot. And the hits don't stop there; the EGG's curved, minimalist shape and matte finish exude quality, and allow the unit to mesh with any setup. 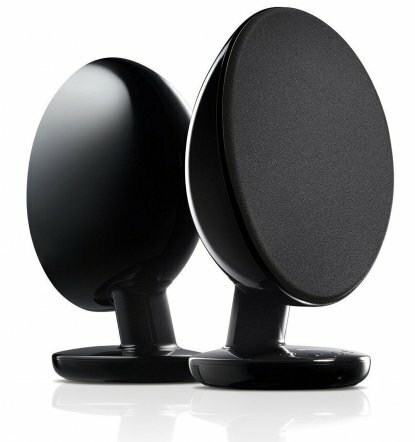 As testament to KEF's build quality, each satellite feels robust, sitting firm on its stands and weighty to the touch. The left speaker has controls for power, volume up, volume down, and source, which produce a satisfying click when pressed. It has 3.5mm aux connection, an optical input for supporting soundcards and T.Vs, a micro USB connection for PCs/laptops. Oh, and it's primary connection is Bluetooth. Phew, talk about options! Our only beef is jerky sized and common among most 2.0 setups. The higher the volume, the more noticeable the lack of a subwoofer becomes. When discussing this model, it's also important to remember that, for less money, you could get an equally-good-sounding 5.1 set-up like the Logitech Z906. If you did however, you'd be foregoing the style, connectivity, and build quality that KEF are able to deliver here... Read our in-depth review. What We Like: Small speakers, big sound, portable. We had to know, do the JBLs sound as smooth as pebbles? Are they as solid as a rock? Mineral jokes aside, it's time to wipe the slate clean and be crystal clear: these speakers are pretty decent. The Pebble's audio quality, while not as good as the SoundSticks, is definitely better than the Creative T40's. For their size, if not their price, they sound balanced and clean. In all honesty, however, the appeal of these speakers is more in design than sound. We love that the Pebbles aren't just powered by USB - they receive signal via USB. That means minimal cables and less fuss. All on-brand, this solution is smart, simple, and clean. Of course, there is a 3.5mm input if you need it, but otherwise, it's USB and done. We dig the design of these speakers, and although they look more like headphone cups than pebbles, we can see what JBL were going for and we dig it. The minimalist style is aided by a clever design decision, whereby the USB and 3.5mm jack cables are wrapped around and inserted into the base of each speaker, creating a unique cable management solution and increasing the portability at the same time. While we praise the Pebble's features, we have to say, these are the kind of speakers that trap buyers. The value is all in flair, and you're paying more for a lesser audio experience with some neat features. If you're more audio-focused, we suggest you try out the Edifier e10's and save some money. That said, if all you want is a decent sounding 2.0 speaker setup, hate clutter, and value portability, you can't do terribly wrong with the JBL Pebbles. What We Like: Good sound, solid looks. What We Don't: Slightly overpriced for what you get. Up next is one of the best looking 2.0s on our list: the Creative Gigaworks T40 Series II. What these speakers offer is crisp and clean mids, and highs that provide excellent clarity when gaming or listening to music. We loved the accessibility of the individual bass and treble controls on the front of the right speaker, as well as the headphone out and auxiliary in connections – something which we feel was missing on the Edifier R1700BTs. What we didn't love was the overall value of the buy. What these speakers don't provide is a subwoofer. Considering that the T40 sits just below the price range of the Harman Kardon's SoundSticks III – which provides a subwoofer and Bluetooth connectivity – this was a hard pill to swallow. These are what we call vanity speakers. They look good, feel solid, sound decent, but don't quite deliver where it counts: value. 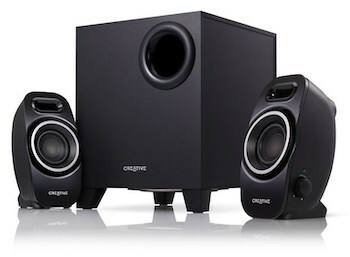 If you don't have the space to accommodate a subwoofer, and you want to spend slightly more to get a marginally better sound than the Edifiers e10s, then the Creative Gigaworks T40 series II are a decent buy. For everyone else, we'd recommend spending up a bit and going with the SoundSticks, or at least saving some coin on the e10s. What We Like: Clear, detailed sound, understated design. What We Don't: Less value for the price. 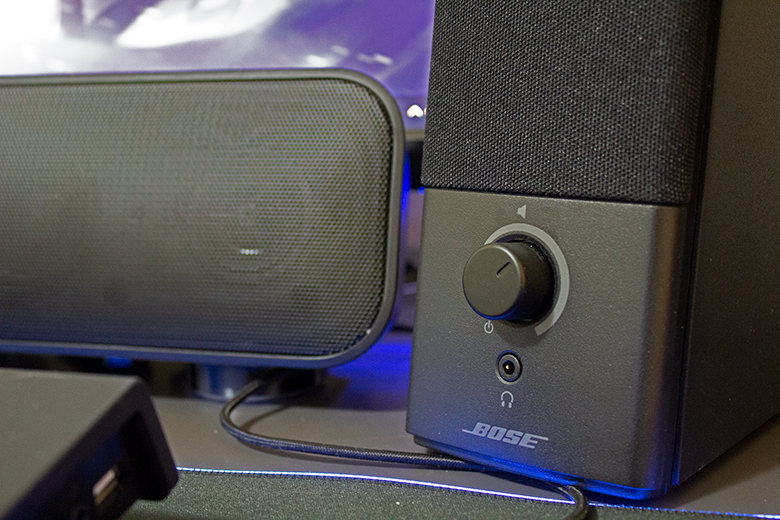 Out of the box, we were slightly dubious when we felt how light the Bose Companion 2s were. We all suspected that they wouldn't be able to deliver the goods, but were pleasantly surprised when we started our testing. For a 2.0 system, the Companion 2s deliver an unexpectedly wide and detailed soundstage. The bass, although lacking any gut punching ferocity, was still handled well in the mix, and it was only when testing at over 80% volume that we really noticed any muddling of frequencies. 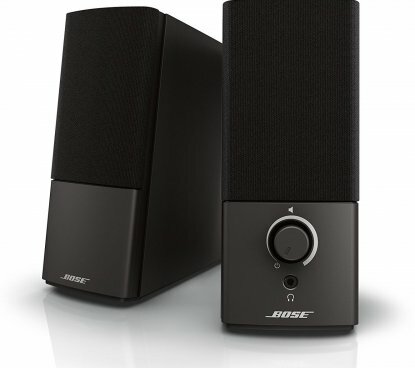 We like the design choices Bose have made. Understated looks, upward-angled positioning, a front facing headphone out, and rear facing aux-in for mobile connectivity. Although a simple touch, this kind of accessible connectivity is missing on more expensive systems like the Audioengine A2+. It's unfortunate for the Companions that, because of their price, we had to compare them to the Edifier e10s. Evaluated on their own, the companions might have been higher on our list, but compared to the e10s, the Companions lack the sustainability, depth, and bass response required for a top budget spot. In our opinion, the e10s are the smarter option for the same money, and just have an overall louder, fuller and richer sound. What We Like: Great price, nice gamer-centric features. What We Don't: Harsh highs at louder volume. RGB lighting on speakers…Really? We're used to headsets equipped with RGB, but speakers were a new one for us. A point in the BlasterX's favor, is that these lights are fully customizable, and can even be disabled. Lighting aside, the build of these speakers is pretty impressive, and they feel extremely robust for their price. What really interested us with these speakers were the gamer-centric features. 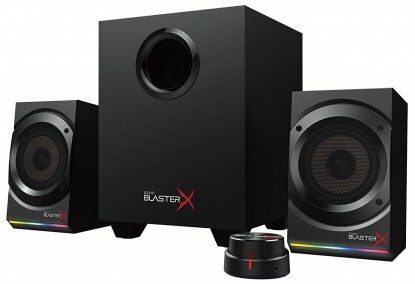 The BlasterX's boast an additional USB connection which sets it apart from a lot of the speakers on our list. And we'd highly recommend using that USB connection because, not only does it allow access to the SoundBlaster Connect software, it leaves room for you to connect your mic to the BlasterX's controller, circumventing any feedback hum. Sound-wise, these speakers aren't terrible, but they weren't anything too impressive. Highs get harsh quickly as the volume climbs, while mids struggle to add definition to the mix. The lows are fine, but feel disjointed at times, and unless you have the bass set to max, it's hard to hear it at lower volumes. We're not saying these speakers are bad, just that they're not great for anyone looking for profound sound experiences. The software is a saving grace for this product and allows you to perform a swath of customizations on the sound output, microphone, and RGB lighting. The lighting may have more options than the audio, but we kind of expected that from a gamer-centric product. 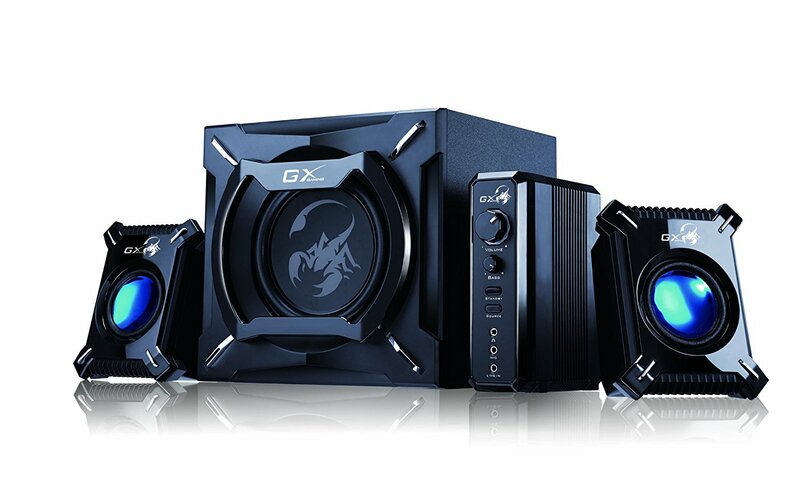 Overall, we have to say this product is good for gamers, but grating for audio enthusiasts. What We Like: Decent build, gamer-centric styling. What We Don't: Distortion at higher volumes. Rounding down our roundup, we have the Genius SW-G 2.1s. And after testing this model, we're not sure Genius is as smart as they advertise. For the price, the gamer-centric speakers lack the qualities that launched other 2.1 options, like the Logitech G560s, higher on our list. Any fan of Drake's latest album will revel in the massive scorpion decal emblazoned on the subwoofer of this 2.1 setup, but that's where the worship should stop. At medium volume, the sound the Genius SW-G will have you nodding your head and wondering why we're cautioning you against them. But after you start to crank up the volume, you'll stop nodding your head to the tunes, and start reaching for the volume knob. These things get shaky when they get loud. The mids, which are actually quite clear at lower volumes, don't hold up when cranked, and you start to feel a decrease in overall quality. The build itself is decent, but in the face of poor sound quality, almost irrelevant. Overall, at $100 we're always going to give the G560s the nod over the not-so-genius SW-G 2.1s. CES this year was dripping with new audio products. Everyone came out in spades and some really cool tech was announced. It seemed every company has some form of wireless speaker or soundbar with Google or Alexa integration, and we're excited to test the lot of them. One particular product we're excited about comes from Sony. They've announced their new speaker/headset lineup featuring 3D technology, and has demoed their insanely cool LSPX-S2. 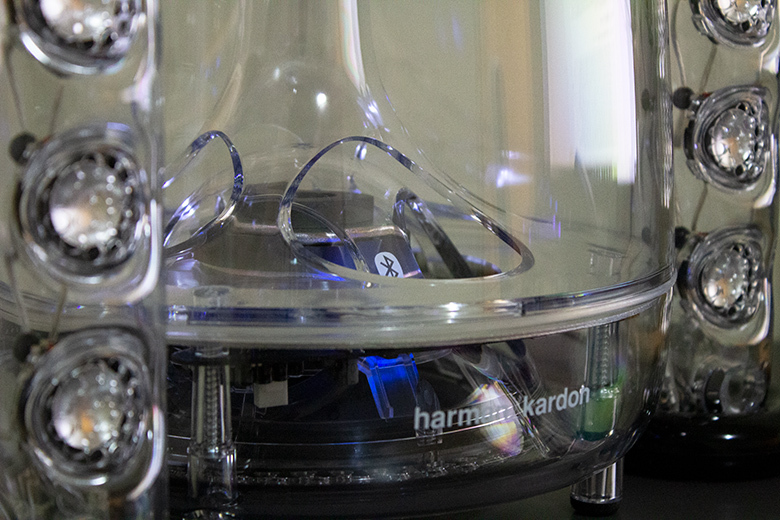 The LSPX-S2 Glass Sound Speaker looks like they screwed a lightbulb into a Harmon Kardon Soundstick. Allegedly, this small and innocuous speaker can fill a whole room with premium sound, and we are excited to test that out. We'll let you know how it holds up, and if it could be a viable desktop computer option for your setup. Audioengine A2+ $249 60 Watts 3.5mm, RCA, USB 95dB 6" x 5.25" x 4"
Edifier Exclaim e10 $100 36 Watts 3.5mm 85dB 12" x 7.1" x 4"
Edifier E25 Luna Eclipse HD $184 75 Watts 3.5mm, Optical, Bluetooth 85dB 8.7" x 8.3" x 4.8"
Audioengine A5+ $399 75 Watts 3.5mm, RCA, USB 95dB 10.8" x 7" x 9"
Edifier R1700BT $150 66 Watts RCA, Bluetooth 85dB 9.7" x 6" x 8"
KEF EGG $500 50 Watts 3.5mm, Optical, Bluetooth, USB 95dB 10.8" x 6.8" x 5.4"
JBL Pebbles $260 Unknown 3.5mm, USB 89dB 5.2" x 5.9" x 3.1"
C.G. 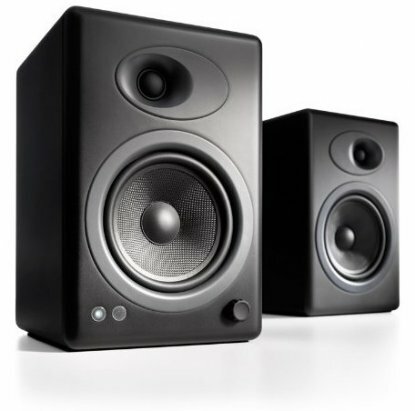 T40 Series II $150 32 Watts 3.5mm 80dB 12.6" x 5.9" x 4.6"
Bose Companion 2 Series III $99 Unknown 3.5mm Unknown 7.5" x 5.9" x 3.1"
How Much Should You Spend on Computer Speakers? When it comes to speakers, sound quality can seem nebulous, but it's always king, and we would never recommend a pair of speakers that don't deliver a truly premium sound. Don't be fooled by the numbers, and always remember that bigger does not equal better. We will always make note of when a set of speakers is built right - quality is important to us and should be important to you. For most gaming gear, build quality is more often associated with the product's durability rather than performance - this is true of gaming headsets as well. however, when discussing speakers, the opposite is true. Because of the way a speaker produces sound, those with poor designs or cheap builds will almost always sound worse. Your budget will keep this constant search for the best built speakers within reason, and that brings us to our final consideration: value. Value is what makes the world go round. Like most things in life, just because a speaker costs more doesn't mean it's better. Sure, when dealing with tech, there's a strong correlation between performance and cost, but it's important to understand what is driving that cost. Your wallet might be suffering for the bells and whistles you're seeing rather than hearing. Many expensive speakers command their higher price based on extra features you might not be taking advantage of, or because of ubiquitous branding. Conversely, just because something is cheap and lacks features or a familiar brand name doesn't necessarily mean it's a bad product. There's a fine balance between cost and capacity, and we spent a lot of time dialing in on the details so you don't have to. As always, we're confident in our picks. Anything we recommend, you'll love. Like most things audio-related, you tend to get what you pay for. If you buy cheap, you're normally sacrificing sound and build quality. However, if you spend too exuberantly, you can end up paying for features, functionalities, and connectivity you don't need and won't use. What we'd suggest is establish your budget, think about what features are most important to you, and find something that has those features at that price. We've included lots of models at different price ranges and are confident in each recommendation we make in this round up. Some gaming monitors actually come with built-in speakers. Surely, they will suit gaming, then? Not exactly. With the slim profile of all modern monitors, it's impossible to fit decent sized drivers inside a monitor's case. Without decent drivers, you're not going to achieve a great sound. On top of that, the gaming monitor market is extremely competitive, and companies are always looking to undercut their competitors - meaning most monitors don't come with built-ins at all. Or, if they do, they will be low-end to keep manufacturing and sales prices low. Sure, you can use your monitor's built in boomers, but we can guarantee it's not going to be a premium experience - especially over long periods of time. Fear not, however, if you already blew your gaming budget on a new monitor with crummy speakers, you can always pick up something like the Creative A250, which for less than $30 will provide a massive improvement over any built-in speakers out there. 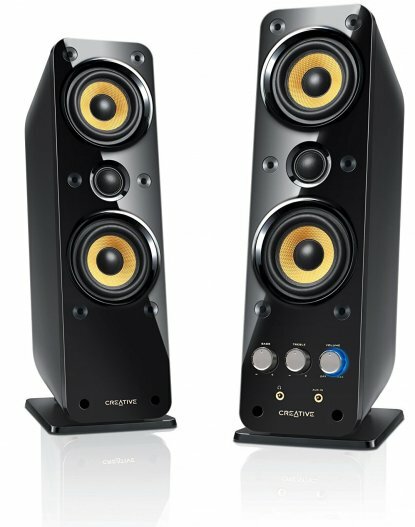 Can you use Bookshelf speakers instead of Computer speakers? In short, yes. But if you've read our best bookshelf speakers of this year, you'll realize these type of speakers aren't suited to direct pairing with a PC or laptop. Because most bookshelf speakers are passive, they require an external power source to actually produce sound. That means that they require an amplifier – usually a stereo amplifier. Stereo amplifiers not only increase the cost of your rig's audio setup, but also drastically increases the amount of equipment you have to deal with - this means increasing the complexity your setup, and the amount extra tech crowding your gaming space. When it comes to gaming setups, we always recommend streamlining wherever possible. You have enough to focus on with hardware and software that you shouldn't have to worry about integrating your accessories. That's why every one of the speakers on this list is an active speaker – each one of them contains its own amplifier— which means you won't need any external power requirements beyond plugging them into an outlet (or, in some cases, your computer's USB port). That's a real advantage when all you want to do is boost your laptop sound, and it can really save precious work-space on your desk. Of course, there's absolutely nothing to stop you from going the bookshelf-speaker-and-amplifier route. Many amplifiers incorporate a USB connection now, meaning you can plug them straight into your computer and get yourself some very fine-grained control over the sound. If you're going to go this route, we strongly recommend investing a little bit of money in a separate DAC (Digital-to-Analog Converter). These have dedicated chips that do a great job of converting digital 1s and 0s to noise you can actually hear and enjoy – which, after all, is the whole point. Ok, so 2.0 or 2.1? What's the difference? 2.0 refers to the left and right (stereo) channels, while 2.1 refers to the left and right channels with the addition of a subwoofer. Now, what a subwoofer does – apart from bother anyone who might live below you – is offload the heavy bass frequencies away from the small drivers (speakers) inside your left and right satellite speakers, and divert them to its own dedicated driver in a separate unit. One thing to bear in mind with a subwoofer, is that it usually goes on the floor under your desk. So, if you live with parents or in an apartment building, a thundering down-firing subwoofer - as seen on the $200 Razer Leviathan - may not always be ideal. The benefits of a sub are that you get a much fuller and deeper bass response, as your satellites only have to focus on delivering the mid and high frequencies. This results in them delivering a much clearer sound, while avoiding muddiness and distortion. But do you need one? Well, that depends. 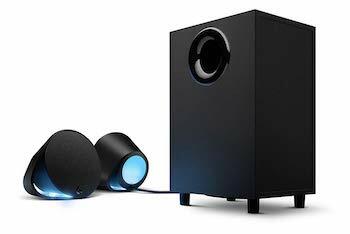 A subwoofer can closer replicate a cinematic experience, and in-game, freeing up your satellite speakers of bass frequencies can mean hearing important audio cues more clearly. If you want big explosions during games and movies and like to feel the music you are listening to, then it's almost essential you get a sub. If you want a simpler sound experience that doesn't risk your eviction, we recommend a 2.0 system. To further complicate the decision, there are 2.0 options which provide great bass response without it becoming as overwhelming as some 2.1 setups - just know these types of setups are costly and you will pay for that level of quality. If we're coming right down to it, the best 2.1 solution in our opinion, in terms of audio, build, and design quality, the $200 Harman Kardon SoundSticks III take the cake. And the best 2.0 solution would be the A2+ from Audioengine, which cost $249. 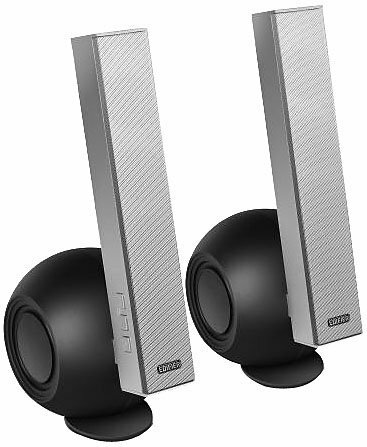 Connectivity is an important consideration when purchasing computer speakers. The standard input is a 3.5mm jack and is present on every speaker in our list. This is same connector you use to plug headphones into your phones or tablets. This is great, as it means you can connect your speakers to a variety of sources. However, as it's an analog connection, it's open to feedback and background distortion in the form of white noise, if that connection isn't tight. Another connection input found on almost every computer is USB. USB is a true plug-and-play connection, as your computer will digitally recognize the device and usually set it up automatically. As a digital connection, USB avoids the potential for distortion through the physical contacts of auxiliary jacks and ports. 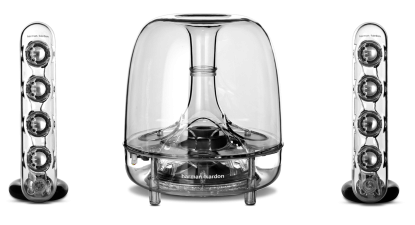 A less common type of connection is optical. Found on the likes of the $200 Razer Leviathan, this digital connection allows you to hook up your speakers to most modern TVs and game consoles. You won't really find an optical connection on default computers, as it typically requires a special soundcard or audio interface to get it working on your PC. A couple of the speakers on our list – like the $150 Edifier R1700BT and Razer Leviathan – sport Bluetooth connectivity, allowing wireless connections to any device that supports it. When comparing connections, the most important thing to keep in mind is: more is more. Sure, you may not use all of them at the same time, but added connections means your product can connect across multiple platforms, which in-turn increases the flexibility and value of that product. Speakers with limited connections aren't necessarily worse; just make sure you're getting the ones you need. One of the stats that causes confusion when comparing speakers is RMS (Root Mean Squared) wattage. Wattage is a measure of power. Although it's not an exact analog, when dealing with speaker wattage, you can generally take it to be a measure of loudness. Put plainly, the more wattage, the more volume you're likely to get out of a pair of speakers. Now, you have to be careful that, when dealing with wattage, you're talking about RMS and not maximum wattage. Max wattage is unsustainable for any period of time and will lead to blown speakers. RMS however, is value that – derived from a complicated bit of mathematics that isn't important to us right now – give us a standard figure to compare speakers against each other. In the case of computer speakers: when we talk about the RMS wattage, we are referring to the total wattage produced per channel. To complicate things, manufacturers don't usually include specs like subwoofer wattage in this, making it tricky to gauge the overall RMS wattage of certain 2.1 setups. That being said, it's still a useful thing to know, and essential if you're trying to gauge which speakers to buy. There's no point, for example, in paying for the 500 watts of the $399 Logitech Z906 5.1 - because make no mistake, you do pay for extra power - when 45 watts of the $140 Genius SW-G2.1 2000 will do just fine. Look at your space and make an educated guess about how much power you need. It's okay if you're not sure, because even the lowest power speakers on our list will satisfy! Essentially, sensitivity is a measurement of how loud a set of speakers will produce sound at a particular power level. So, the higher the sensitivity rating, the louder the speakers will perform. In principle, a higher sensitivity rating is indicative of a higher quality speaker, but not always in practice. It's worth taking this spec with a pinch of salt as, due to variance in power sources (amps, interfaces etc. ), the measurement of sensitivity is not always a true representation of how loud speaker will sound to you. At this point we'd like to give you the best piece of advice out there for speakers: Get your hands on them and try them out. Order some online, and if you're not happy with them, swap them for a different set. That being said, every set of speakers in our round-up bangs. So, if you're not sure, have another read through our list, make your pick, and sleep easy tonight. It's no secret that premium speakers deliver premium sound. While most of this can be accredited to the speaker's internals (tweeters, woofers etc. ), a surprising amount is based on the design. For example, the $399 Audioengine A5+ use nothing but high-end components. However, due to their flat-bottomed design, unless you position them correctly (at ear level) you won't be getting the full effect. On the flipside, some speakers – like the $184 Edifier E25 Luna Eclipse HD – use an angular bottomed design in an attempt to direct sound towards the user's general ear level. To ensure you are getting the best from your setup, it's important you set it up correctly. That can mean investing in speaker stands. We all know that, when speakers project sound, they vibrate. 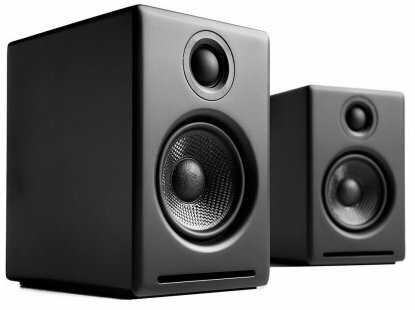 If speakers are sitting directly on a desk, shelf, or floor, the vibrations can leak into surfaces, becoming audible and muddying the bass and lower mids. The louder the speakers go, the more noticeable the effect. That's why, with speakers like the Audioengine A5+, we recommend purchasing a set of isolation pads. Isolation pads – or decouplers – consist of a spring and a dampener. These work to remove the contact between your desk and the low-end vibrations emanating from your speakers. This allows the speakers to project the sound as intended. Most pads come with angular inserts, and they can all be used with speaker stands.